Does the software run on Chromebooks? Yes! Please see our software page for full details. Does the software run on smartphones or tablets? Unfortunately, not. The lack of a USB port on these devices mean that they can’t be used to program the Crumble. My Sparkles don’t work (or only light dim red)! The Sparkles require an external power source. Connect a 3AA battery pack, ensuring that the batteries are fresh and that they are the right way round. Also ensure that the right-hand side “+”, “-” and “D” pads on the Crumble are connected to their equivalents on the left-hand side of the Sparkle (wiggling the croc-clips can help form a good connection). The diagram, below, may also help. The motor LEDs are red, but my motors aren’t turning! 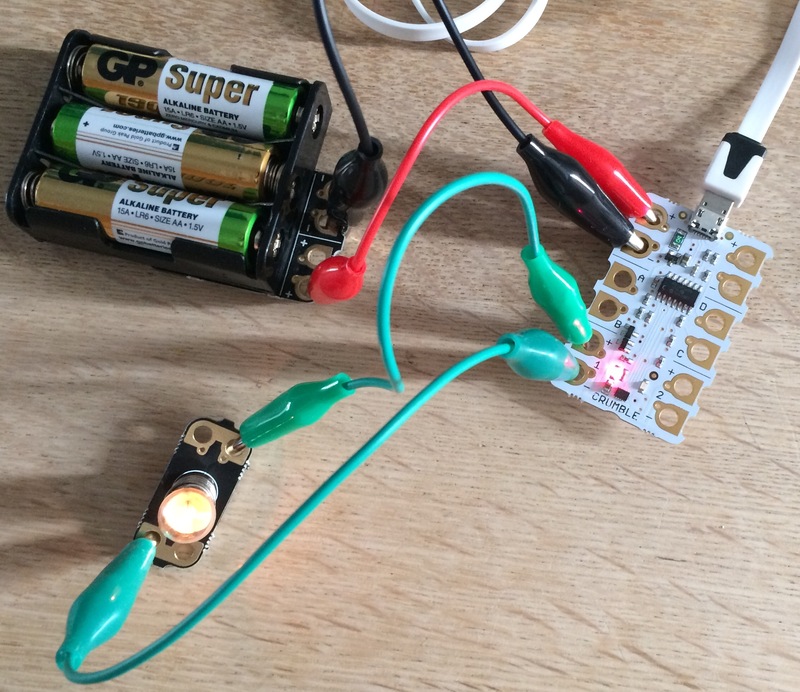 The on-board motor LEDs can receive power from the USB lead but, like the Sparkles, the motors, themselves, require external power from a 3AA battery pack. I have connected power, but the motors still don’t turn and the motor LEDs are flickering! The motors draw more electrical current when they first start. A partially drained battery pack may not be able to supply this, causing the Crumble to continually reset. Replace the batteries and/or try reducing the motor speed. Each operating system has its own colour picker and screen calibration, which may not exactly correspond to the way the colour appears on the Sparkle. You can experiment with the RGB block in the Crumble software (found under the “Sparkles” menu) to set the brightness of the red, green, and blue emitters within the Sparkle separately (0 is off and 255 is maximum brightness). Note that the blue emitter requires a higher voltage than the red and green, so if blue is very dim you need fresh batteries. A short-circuit when using rechargable batteries does pose a risk as these batteries are capable of delivering a high electrical current. The Redfern Crumble-friendly battery box has short-circuit protection on-board which reduces this risk. 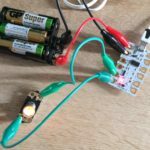 Another issue to be aware of is that a typical rechargable AA battery provides 1.2V (rather than 1.5V), so they do not provide enough voltage for the blue emitter in the Sparkle LEDs. The software says “Crumble not found” even when a Crumble is connected with the USB lead! Try waiting a couple of minutes for the driver to initialise. If this doesn’t work, try a different USB lead and/or USB port. Of course, if the problem persists, please contact us. Is the Crumble a “wearable” device? The Crumble board measures, roughly, 50x30mm, and requires a 3AA battery pack for power, when not connected to a computer, but if you are happy with these dimensions then, yes, you can “wear” the Crumble. Conductive thread can be used, instead of croc-leads, to make connections (as shown here) and you can connect specifically designed textile LEDS to pads A, B, C and D.
Do I have to use “crumbs” or can I use “normal” electronic components? Standard electronic components (e.g. LEDs, buzzers, switches, LDRs..) can all be used with the Crumble. I’ve connected a bulb to output A/B/C/D; why isn’t it lighting up? A bulb can be used with the Crumble, but the A, B, C & D outputs don’t supply enough current. Although we usually call outputs 1 & 2 “motor outputs”, they should more properly be called “high current outputs”. You can connect a bulb to output 1 or 2 (see photo, below) and control it with a “motor” block in the software. The example program, below, would make the bulb flash on and off every second. Does it matter whether I connect components to A, B, C or D? Which are inputs and which are outputs? A, B, C, and D can all be used as either inputs or outputs: the Crumble will either set them (outputs) or begin to monitor them (inputs) depending on the instructions from the software. 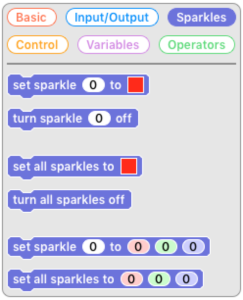 “D” is slightly special because this outputs the data to control the Sparkles, but if there are no Sparkle commands in your program you can use D as a standard input/output. I/my pupils find croc leads too fiddly/slippy. What alternatives can I use? Have you tried our 240mm croc-leads? We have tried many different suppliers and believe that these are easier to use than many others out there. Alternately, terminal blocks can be soldered onto the Crumble or it is possible to insert a 4mm “banana plug” into the larger holes. 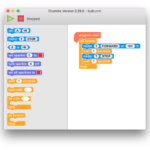 My program isn’t working/the Crumble isn’t doing what I want! Computer programs often don’t do exactly what you (ok, I) expect first time, so learning to de-bug is an essential programming skill. 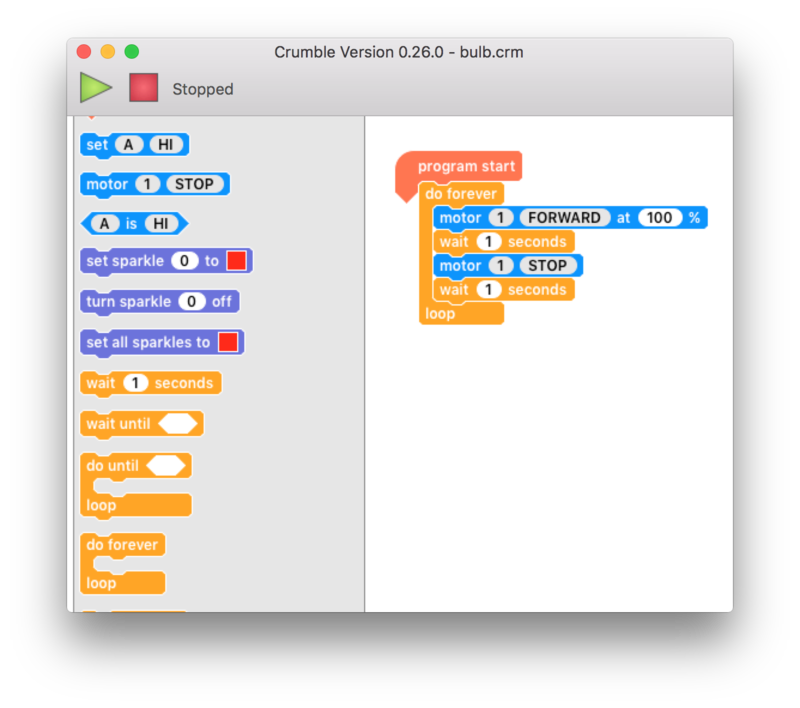 It is important to remember that, without loops or “wait” blocks, the Crumble executes each block of the program, in sequence, within a fraction of a second and stops after the last attached block. If the Crumble doesn’t appear to be doing anything, then putting the whole program inside a “do forever” loop or inserting “wait” blocks can often solve the problem.